The paint is flying but every once in a while a piece of paper distracts me and I have to get the scissors out and play. Over at the Altered Paper Tee is having a Halloween ATC swap. I generally don't do Halloween but this time I had a play with the Gimp program, made my own images then put them to use on my ATC's for the swap. I have a die for the CB and made this distressed fence, placed an Eco shape crow from Artchix on it then place my 2 witches with the moon behind them in a bottle cap and applied it with GA. 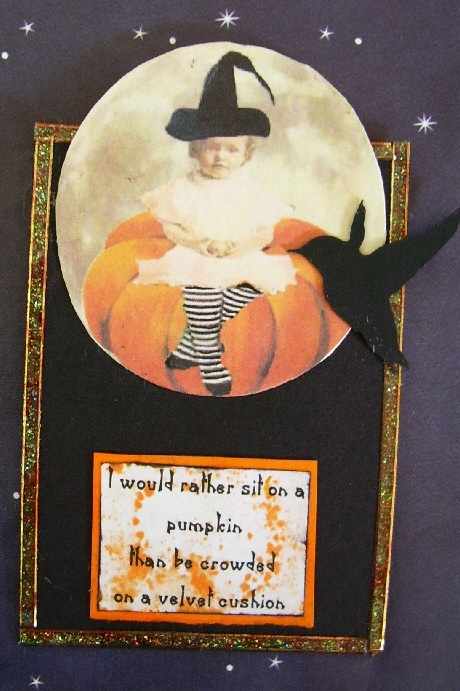 The 2nd image is a girl with zetti striped leggings sitting on her pumpkin with her witchy hat. So cute and fun. 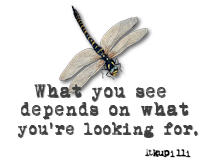 I am loving Gimp but lately haven't been devoting time to it much as painting is keeping me busy. 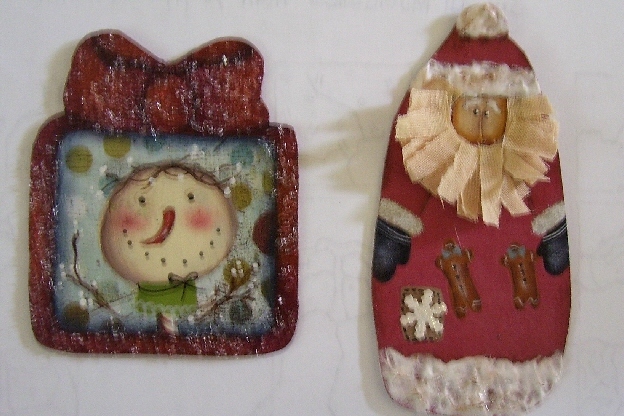 The next 4 ornaments are painted on scrapbook paper. You can see the blue paper behind the snowman, the Santa coat is actual paper. I cut the shape of the ornie out of a cereal/cracker box, covered both sides with scrap paper. If the paper was double sided I chose the opposite sides for the back. I then painted the designs according to the directions. I have been painting for years and I realized I love painting on paper. The will make great little tree ornies and you could also use them as gift tags and the recipient could then hang them on the tree so it is quite useful. And...this year I bought Diamond Dust glitter and ooooo I just love the sparkle it has when the light hits it. So different than the usual glitter, it is actually made of ground glass. I have to take precautions when I use it so little Rosiecats doesn't get any on her paws. More glitter and glitz. You can't see the Joy on the hymn book but it is there in gold gel pen. 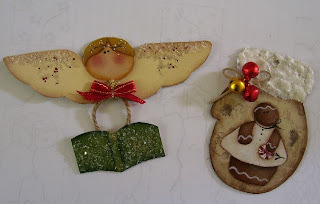 And the little green branches on the angel wings are a stamp I used. 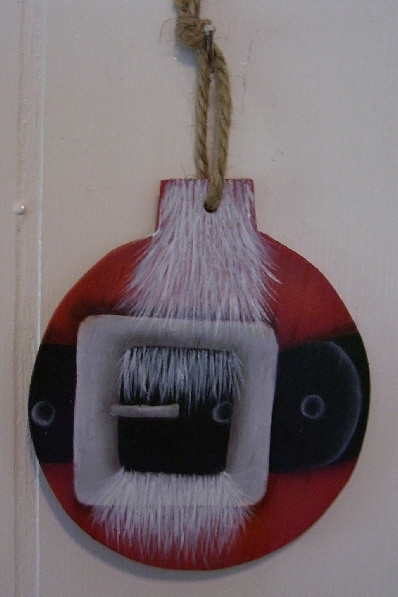 And this little fella is from an old paint book I have had for ages. 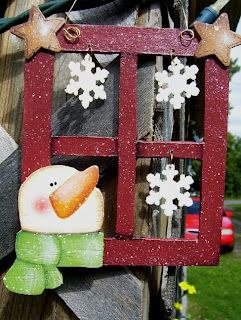 I used chipboard to make the window instead of wood, I sealed it well, painted it and then put this all together. As you can see I took the pic outside, I don't have a tree set up yet to take ornament pics so it was a bit bright out today but you get the idea. And today hubs cut out more ornaments for me so I have another pile waiting on my desk. I should have them done by next week as long as nothing stops me in my path. If I could and didn't require sleep I would paint during the night then I could have all day to do my usual day stuff. Oh well I work it in when I can. 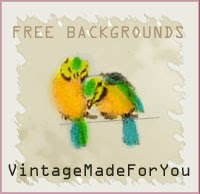 Wow- what great work you did in Gimp- I have no clue how to do that- but one day I will learn..... Your ornaments are fabulous! I love Diamond Dust glitter- my Mom paints porcelains and makes ornaments- and she told me about it- it is fabulous on the Christmas tree!!! You have such a talent Les!! Love those ornies!! 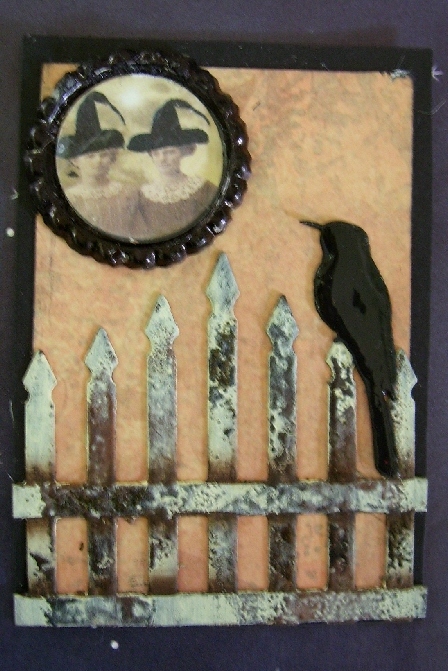 ..and the Halloween atc's are fab, loving what you did with the fence. Awesome work as always ! Ooh Love it All! So Creative! Great ATC's & The Tag/Ornaments are Gorgeous- Will Make Beautiful Gift Items! Everything looks great.. love the weenie Atc's and the ornies are too cute.. I still haven't found that ornament mag yet.. ugh! glad you're getting alot done.. Darling ornies Lesley and your so ahead of the game already!